PQ & HLG playback; Inferno will now support both HDR luminance standards, PQ (ST2084) and HLG (Hybrid Log Gamma) expanding compatibility with HDR flat screens. Scheduled playout; In addition to instant playback and playlist generation for reviewing set clips or marked favorites, Inferno can schedule playout for live events, instore demonstration etc. HDR NLE metadata support; AtomHDR makes setting correct exposure easy on set, now by storing those settings as metadata, color grading is made easier by helping reproduce the same result in post. An exciting partnership with G-Technology continues to expand the affordability and workflow speed of our patent pending Master Caddy system by directly integrating it into the G-Technology range of ev Series solutions. 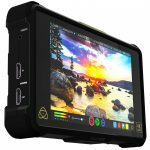 The Master Caddy system is a critical pillar in the Atomos success story, used across the entire range, it delivers Apple ProRes 4K HDR for under $150 per hour with the peace of mind that comes from using reputable media brands. Now the same affordable SSD drives can remain loaded in the Atomos Master Caddy after the shoot, loaded into a G-Technology ev Series Reader (Atomos Master Caddy edition) and be used across the range of G-Technology ev Series desktop editing systems and high performance RAID systems. For Arri users the simple 6G SDI connection with Alexa Mini and Amira unleashes the full capability of the sensor, monitoring a HDR image perfectly engineered for Arri log. Additionally, by recording Arri raw externally to the native .ari format you gain an incredibly affordable recording solution. For example, a 256GB SxS memory card, which is typically $1700 can be replaced with the same capacity SSD for less than $100. For Panasonic Varicam users who already have internal HD recording to Apple ProRes, the Shogun Inferno offers higher resolution 4K Apple ProRes and AVID DNxHR in 10-bit quality. It also doubles as an affordable solution for recording raw and will benefit from the calibrated 7” 1500nit monitor, which with AtomHDR perfectly displays V-Log in HDR quality. For Sony FS7/FS700/FS5 users the raw output in their camera can be put to work, recording high frame rate footage onto affordable media without the license cost found on other recording solutions. Additionally, the 1500nit brightness will enable hood free outdoor shooting and monitoring of Slog2 and Slog3 in HDR to let filmmakers confidently set exposure, shooting in log as it will be seen in post-production. For Sony F5/F55 users the QuadLink SDI connectors provide a direct and convenient connection to a monitor-recorder that opens up access to the media affordability of the Master Caddy system along with the premium HDR monitoring that can be used with the Slog2 output. For Red Epic/Dragon/Scarlet users, Apple ProRes offers a great proxy recording option with file name along with the dramatic improvement that the 7” 1500nit monitor makes for focus. For accurate exposure, the Red Log or ST2084 output lets you activate HDR on the Shogun Inferno for accurate HDR imaging. For Canon C300MKII/C500 users the raw output offers the only way to record 4K resolution without paying for licensing fees and delivers Apple ProRes and AVID DNxHR recording, HDR monitoring and an affordable media solution. For the new C700 camera from Canon, the Quad 3G SDI connections allow for higher frame rate 4K 60p ProRes recording to affordable SSD media along with the HDR and High Bright monitoring advantage that comes with using the Shogun Inferno. Melbourne, Australia – 9th September 2016: The world’s most advanced monitor recorder, the Shogun Inferno is shipping this month and with it a raft of new IBC feature announcements that includes Arri & Panasonic HDR Raw recording, expanded PQ & HLG compatibility for playback to HDR screens & wider support from editing packages for mobile HDR editing. A new partnership with G-Technology is also set to benefit the entire Atomos community by directly integrating the Atomos Master Caddy into the G-Technology ev Series workflow solutions. 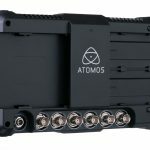 Over the past six years, the Atomos family of Ninjas, Samurai and Shoguns have redefined what monitors and recorders can do by merging what was a separate feature set for recording, playback, monitoring and editing into a single device. This continues with the Shogun Inferno, headlined with a ground breaking HDR feature list that continues to grow at IBC 2016, but also boasting functionality such as 1500nit high bright, 10-bit monitoring with Scheduled Playlist and meta data tagging that alone changes the benchmark for what a camera monitor can do. “We’ve seriously changed the monitor world with the combination of HDR and High Bright daylight monitoring – the image we create for a field monitor rivals the quality you see with high end studio monitors. 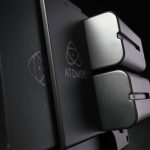 For the price, we basically include recording, playback and editing for free”, said Jeromy Young, CEO and Co-founder of Atomos, “The Shogun Inferno is our final piece in the HDR puzzle. Arming high end cameras and filmmakers with the high frame rate, high resolution, high dynamic range & high brightness monitoring, recording and playback needed to get the most from the amazing sensors crafted by Arri, Sony, Panasonic, Red and Canon – we truly do upgrade these amazing solutions”. Shogun Inferno shipping September with the previously announced specification list i.e. QuadLink SDI & HDMI 2.0 for 4Kp60 / HDp240 recording, HDR Log and Raw recording, AtomHDR engine with 10+ stops dynamic range for perfect exposure monitoring, a 7” 1500nit high bright monitor for hood free outdoor monitoring and advanced 10-bit monitor processing for more colors and less banding. The ev Series Reader Atomos Master Caddy Edition is available in September with an MSRP of $99.95.